The Joy of Oyster Mushrooms, at Home! I purchased some Oyster mushroom spawn from a reputable source, during Spring 2010. 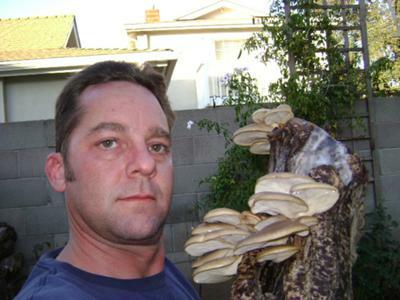 By Fall, and now into a rainy December in Southern California, I am harvesting great quality, right here at home. I'm using Cottonwood logs, raised on saw horses to keep the bugs/slugs off of them. These retail for anywhere from $6 to $8 per pound! Comments for The Joy of Oyster Mushrooms, at Home! Amy, I am in MA and I am growing oyster mushrooms indoor now (and im in the hills so have snow here now). Admittedly, I am using one of the kits you can get at Whole Foods, but it works! Join in and write your own page! It's easy to do. How? Simply click here to return to Oyster Mushrooms.